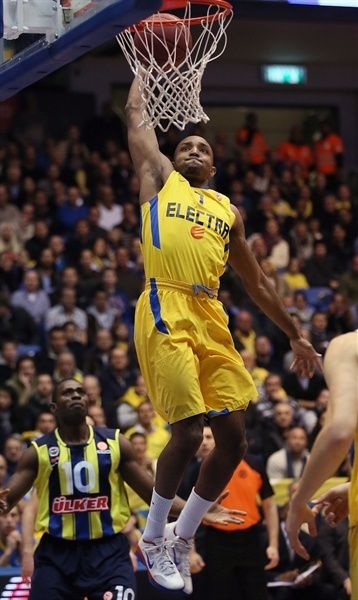 Maccabi Electra Tel Aviv routed Fenerbahce Ulker 91-73 Thursday night at Nokia Arena for the Israeli champs’ first Top 16 win. Ricky Hickman and Shawn James starred with career highs of 24 and 22 points, respectively. The win means Maccabi will have a share of fifth place in Group F by the end of Friday’s action with a 1-2 record, while winless Fenerbahce will be tied for last. 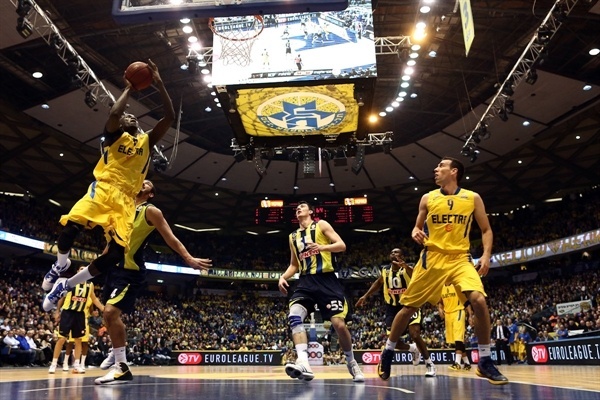 Maccabi used a 10-0 first-quarter run to take control early, but Fenerbahce hung around thanks to Bojan Bogdanovic’s scoring and Mike Batiste’s hard work on the offensive glass earned the visitors a 36-36 tie at halftime. Maccabi reserves Sylven Landesberg, Malcolm Thomas and Moran Roth fueled a third-quarter run that put the hosts up 9 and Roth came up big alongside Hickman and James in the fourth quarter too as the Israeli champs scored 38 points in the last 10 minutes to pull away for the victory. Devin Smith added 11 points and Roth tallied 8 points and 6 assists in just 16 minutes. 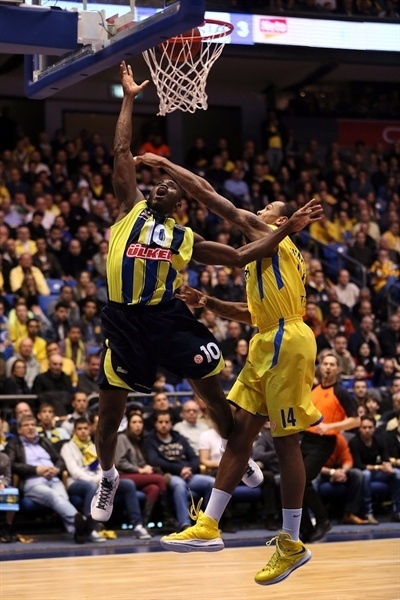 Bogdanovic, Romain Sato and Bo McCalebb scored 15 points apiece to lead Fenerbahce and Batiste added 10 points and 9 rebounds. Maccabi won the opening tip and went to Lior Eliyahu for a quick basket; Bogdanovic came up with the visitors first points on the ensuing possession. 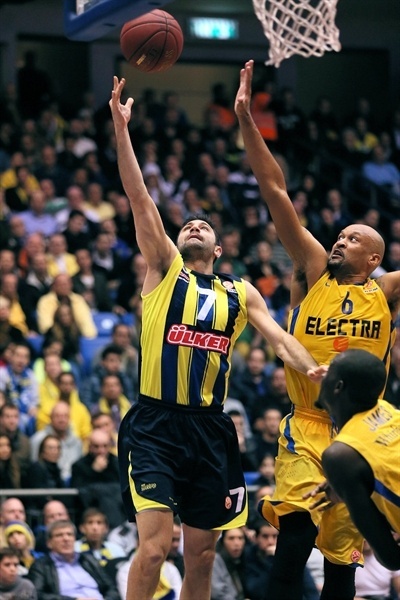 After another Bogdanovic score and a Sato jumper, Fenerbahce took its first lead, 4-6. Hickman created space and threw down a slam to tie it only to see McCalebb up the ante with a triple. Bogdanovic showed off his defense with a block of Eliyahu on the break, but Maccabi regained possession and Smith drilled a long jumper to put the hosts back on top, 11-9. James took over down low with a pair of baskets – the second a two-handed slam-and-foul over Batiste – to cap a 10-0 run. Batiste scored at the other end, blocked James on defense, and scored again to narrow the gap to 3. A tip-in by Sato made it 18-17. 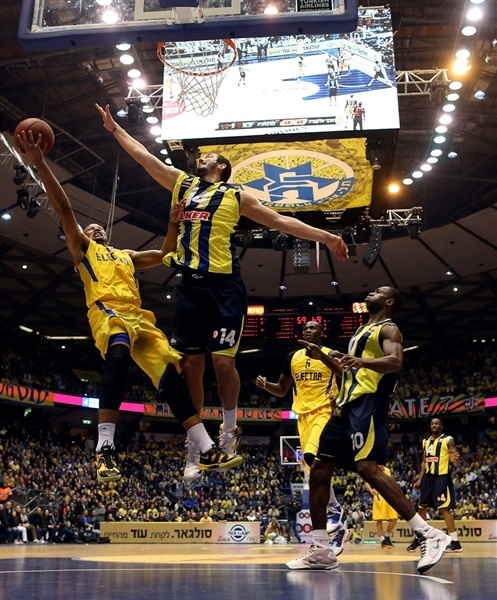 Maccabi regained control with a David Logan three-pointer, but Bogdanovic stole the show with a half-court triple on the first-quarter buzzer to make it 23-21 after 10 minutes. After two scoreless minutes to open the quarter, Sato tied the game before putting the visitors ahead from the line. James muscled his way to another basket inside before Smith lifted Maccabi to 27-26 midway through the stanza. An incredible full court pass from Yogev Ohayon to Eliyahu for a layup caused Coach Simone Pianigiani to call timeout to regroup the visitors. Ohayon put the hosts up 5. 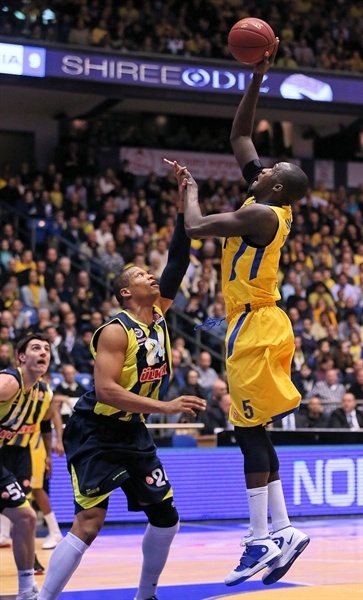 Fener responded through Bogdanovic, but James countered with a three-point play. Bogdanovic free throws were canceled by a Darko Planinic slam that made it 36-31. Batiste scored a pair of baskets on the offensive glass to tie the score. Maccabi held on for the final shot of the half, but Ohayon missed to leave a 36-36 tie on the scoreboard at the break. Maccabi seemed to have more focus than Fenerbahce at the start of the third quarter and layups by Ohayon, Smith and Hickman put the Israeli champs back in pole position. 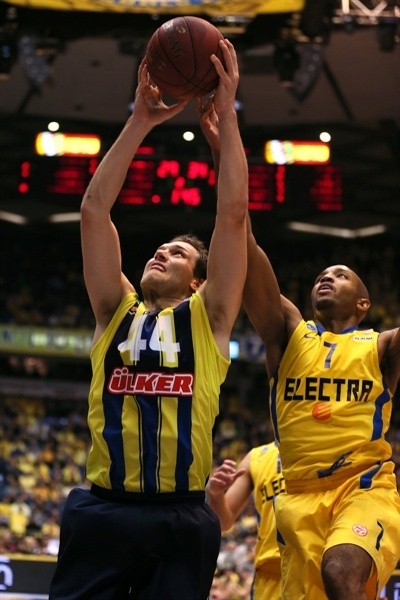 Bogdanovic cut the deficit in half with a three-pointer and Sato closed the gap to 42-41 from the line. 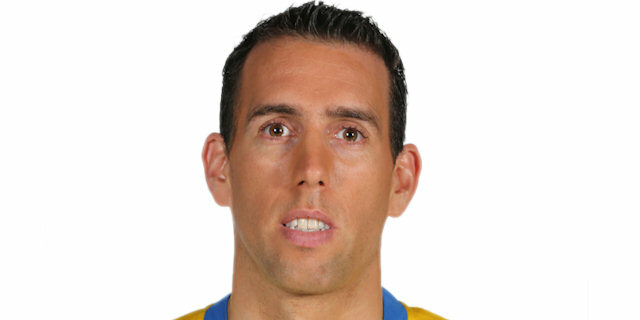 James got a hometown roll on a hook shot to keep Maccabi in front midway through the quarter. Landesberg added points from the line and then a jump shot. Omer Onan sank a triple, but baskets by Thomas and Roth – each player’s first – put the hosts up 53-44. McCalebb attacked the basket for back-to-back scores to bring his team within 53-48 with one quarter to play. Preldzic made a perfect pass to Kaya Peker to bring his team within a basket, but Roth connected on a triple from the corner. Preldzic and Roth remained protagonists; the former scored inside, the latter assisted Hickman. Then Hickman brought the fans to their feet with a penetration through Bogdanovic for a layup-plus-foul to make it 61-52. However Hickman picked up his fourth foul at the other end. 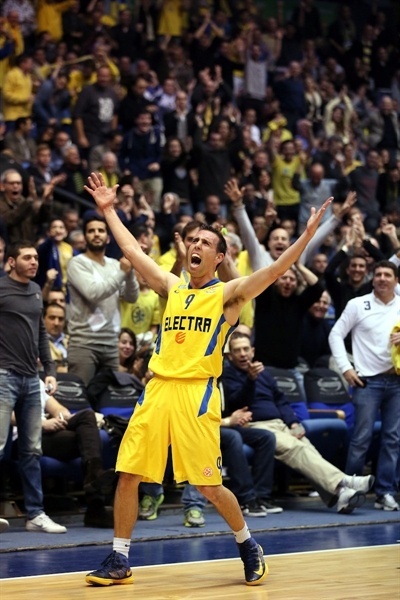 Preldzic scored only to see the red-hot Hickman knock down a triple for Maccabi’s first double-digit lead. Roth set up James inside for a layup, 66-54. 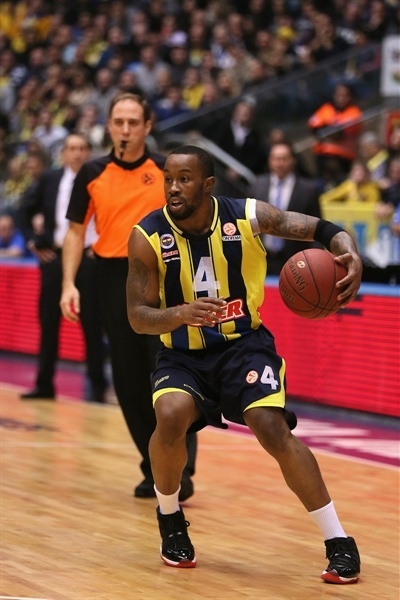 McCalebb sliced through the Maccabi defense for a three-point play, but Roth remained hot with his second three-pointer. Hickman further extended the lead to 76-61with four minutes to go. Even with the outcome seemingly clear, the teams plays tough knowing the difference a potential tiebreaker could make. Hickman, James and Roth continued to produce and the lead swelled to 18 by the final buzzer. "We played good defense tonight. We gave a great show tonight and I salute my players. We didn't expect Moran to give such a show tonight, but we knew he's capable of this. I wasn't nervous before the game. People were talking, but we focused on doing. We missed a win last week in the last seconds, but we played well. I didn't expect to win by such gap, but that's a big, big plus for us." "There were two situations tonight. The first three quarters, considering we played against a team like Maccabi in front of those fans, we played good. We stayed close behind and we wanted to arrive to the last quarter this way, but then things changed. We allowed 38 points in the last quarter and that was maybe a Top 16 record. If someone watched the box score, they would think there was no game tonight, but that's not what happened. 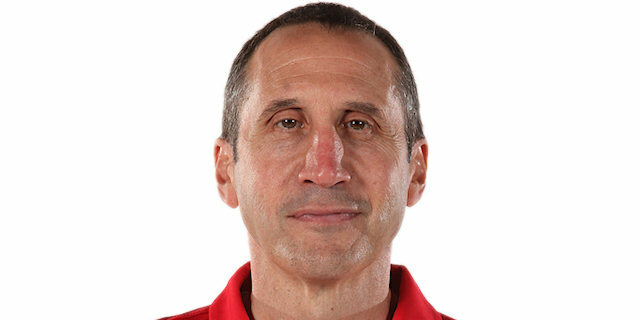 We need to stay together and play 40 full minutes. If we had done that tonight we had a chance to win. Nothing is over yet. We're not in a good situation but nothing is over. We have four home games in the near future and we will need to win them to get back in the race. With Montepaschi I arrived to the Final Four after starting a six-game Top 16 with two losses. There's still time to turn things around, but first we need to play a full 40 minutes." "It was a very exciting game. I'm really happy I could help the team get this very important win. I just went out with energy like always. There's nothing that can compare with lighting this arena. You ask if I was dreaming about this from the moment I arrived to Maccabi and I can tell you I dreamt about it from when I was 5 years old. It's our first win in the Top 16, but now we gotta ride this momentum."